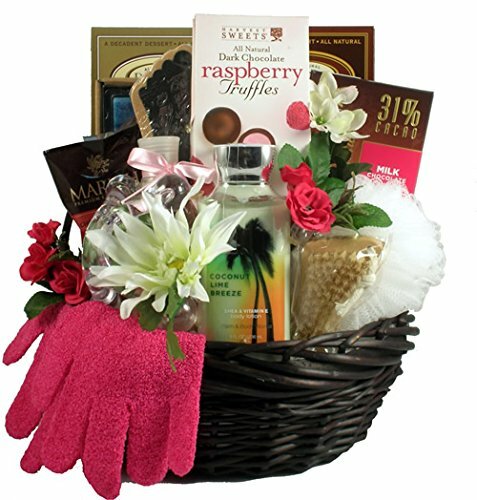 This luxury spa basket is loaded with delicious treats for her to enjoy while she relaxes the cares of the world away. As she discovers all the spa products and fantasies of an afternoon of personal pampering she will find: Creamy Vanilla Dolcetto Finger Cookies, Chocolate Dolcetto Finger Cookies, Chocolate Peanut Delights, Dark Chocolate Covered Graham Crackers, Chocolate Covered Cherries, Godiva Chocolate Truffles, Dark Chocolate Raspberry Truffles, Mesh Body Puff, Scented Bath Salt, Scented Candle Set, Exfoliating Body Gloves, Pedicure Groomer, Manicure Groomer, Scented Body Lotion, Massager. The stress of the day behind her will melt away with this sweet escape basket. This lovely spa gift basket is perfect for the occasion!